1219 K St. as it appeared in March of 1946. 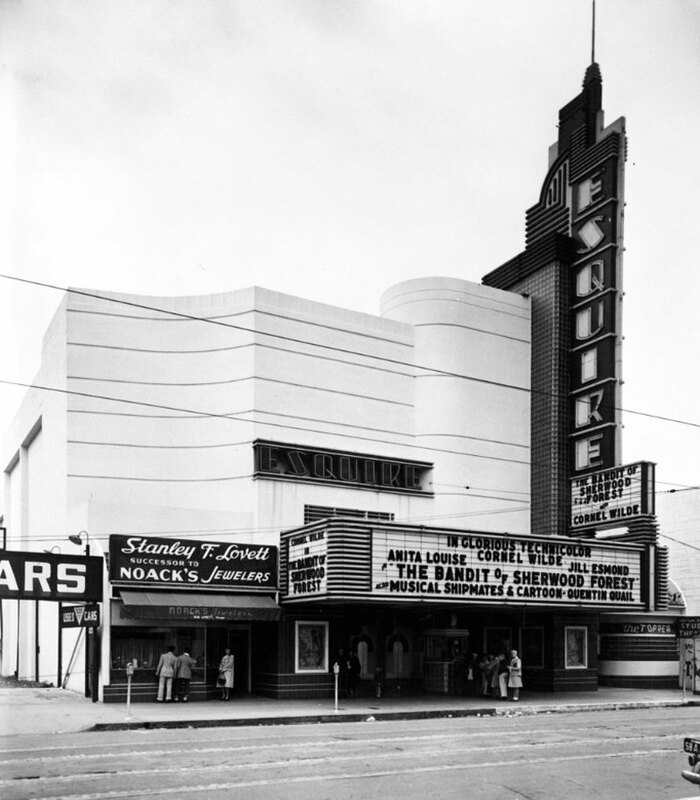 Here we see the Esquire Theatre with its impressive moderne design typical of the transition between Art-Deco and Streamline. It was operated by the Blumenfeld family, who also built the “new” Del Paso and Tower Theatre, which they still own. The Esquire opened in March 1940 and operated until 1982. During those years, one of the biggest attractions was the arrival of Cinerama on October 11, 1963, with its special curved screen and 3 projector system. I saw Jaws there first run, and was taken by the beautiful art-deco archer and milk glass disc situated behind the candy counter. I recall climbing the stair to the mezzanine, my feet sinking into 100% wool carpet with so much padding that you could almost not feel the step. In the balcony, I snuggled into the Heywood-Wakefield rocking loge seat and was entertained in proper fashion. The theatre building was demolished except for the façade and marquee. In 1999, the 22 storey Esquire Plaza Building was built behind, incorporating and surrounding the old theatre façade. IMAX Theatres installed an IMAX screen in the new building, which is accessed through the old theatre entrance. The newly constructed lobby of the IMAX Esquire was designed in the same shape as the original theatre lobby from 1940, and they even included the mezzanine!